After a five-year trial, a member of a neo-Nazi gang has been found guilty of 10 racially-motivated murders. 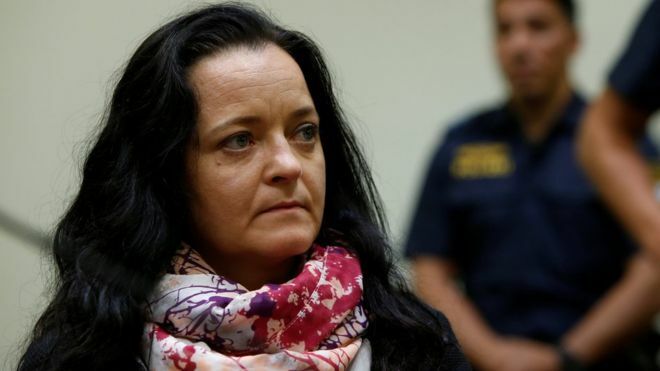 Beate Zschäpe was the main defendant on trial over the murder of eight ethnic Turks, a Greek citizen and a policewoman between 2000 and 2007. The verdict carries an automatic life sentence. The connection between the murders was only discovered by chance in 2011, after a botched robbery led to the neo-Nazi group’s discovery. Zschäpe shared a flat in the eastern town of Zwickau with two men, who died in an apparent suicide pact. The bodies of Uwe Mundlos and Uwe Böhnhardt were found in a burnt-out caravan used in the robbery. Zschäpe, Mundlos and Böhnhardt had formed a cell called the National Socialist Underground (NSU). An explosion at their home – apparently in an attempt to destroy evidence – led to Zschäpe turning herself in. The NSU’s seven-year campaign exposed serious shortcomings in the German state’s monitoring of neo-Nazis, and led to a public inquiry into how German police failed to discover the murder plot. Ralf Wohlleben, a former official of the far-right National Democratic Party (NPD), was sentenced to 10 years for procuring the Ceska pistol with silencer used in nine murders. He was convicted of aiding and abetting murder. André E was given two years and six months for helping a terrorist group. He had visited the Zwickau trio often, sometimes with his children, helping to give the neo-Nazis an air of normality. Holger G received three years for giving his birth certificate and other ID to Uwe Mundlos, to protect him from the police.